Ever wondered what to do when you’re visiting Portland, Oregon? 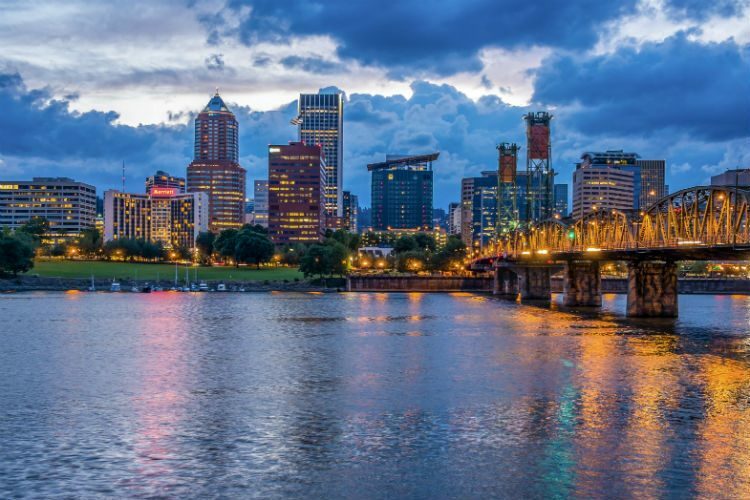 It’s known for its slogan ‘Keep Portland Weird‘, and there’s plenty to keep you occupied! This guest post is by Peter Korchnak, a co-founder of the travel website, Where Is Your Toothbrush? It has been excerpted from the book he co-wrote with Lindsay Sauve, 365 Weird Things to Do in Portland, Oregon . A non-fiction writer, Peter is also the author of Guerrilla Yardwork: The First-Time Home Owner’s Handbook. Other than travel and writing, his passions include playing ice hockey and juggling projects. You can also find Peter on Instagram and Pinterest. A famous line from the TV show Portlandia claims Portland, Oregon is where young people go to retire. And with the younger demographic flocking to the city for its creative spirit, natural beauty, and great food and beer, the snarky comment isn’t too far off. But what about the rest of us? This quirky Pacific Northwest city is known for its slogan, “Keep Portland Weird“. But what is there to do that’s not too touristy, if you are over forty but still young at heart? Portland’s Shanghai Tunnels are a network of underground passages that connect the basements of buildings in the city’s Old Town and Chinatown areas. Believe what you want about the history of these tunnels. Some say they were simply used to shuttle goods from ships docked in the river, others prefer the PG-13 version that involves ne’er-do-wells using the tunnels to shanghai victims to be sold to ships as sailors. Take a tour and decide for yourself. Sometimes the Government gets it right. The Portland Development Commission project in deep SE Portland, Mercado, hosts a slew of Hispanic stores. It includes a market, coffee shop, butcher’s counter and a bar in a small mall-like building flanked by a plaza hosting a row of colorful food carts serving dishes from across Latin America. Portland Mercado is hands down one of the best places to go in Portland for Central and South American food and culture. The painted intersections in neighborhoods around Portland aren’t just art – they’re a statement. City Repair Project, a mostly volunteer-run nonprofit, reclaims public spaces and makes them into places. Paint an intersection. Build a public seating area. Eco-landscape. There’s plenty to contribute to local colour on your next visit to Portland. A flagship property of McMenamins, a Pacific Northwest empire with many cool locations around the region, most in renovated historic buildings. Kennedy School is a converted elementary school that includes a hotel, a soaking pool, and a bunch of restaurants, pubs, and bars. Roam the hallways, drink some beer, soak in the pool. Then cap your night with a cigar and a shot of something warm at the quirkiest bar of all, Detention. The most enjoyable punishment you’ve ever endured. Proof in advertising: Goose Hollow Inn really does have the best Reuben – in town anyway. You can eat it and wash it down with draft beer. On occasion, you can rub elbows with the owner, former Portland mayor Bud Clark, of the Expose Yourself to Art fame. Goofy branding, (kid-) friendly ambience, and tasty food for starters. Sourcing locally, practicing eco-sustainability at its 10 locations (it’s a local chain! ), and supporting good causes for the main course. Beer and wine and smoothies for the rest. Head to Laughing Planet Cafe, one of those somewhat-fast-food restaurants that’s become a Portland culinary institution and a staple of many a neighborhood. Bean us up! The world’s first nonprofit pub makes drinking and giving easy. When you make a counter order at Oregon Public House, you get to pick a local nonprofit to benefit with your purchase. You can easily miss Mill Ends Park, a 452-square-inch expanse of green in the middle of four-lane Naito Parkway next to the Waterfront at SW Taylor Street. The world’s smallest park (and largest leprechaun colony outside of Ireland) exemplifies the best of Portland. Or at least the weird Portland the locals love. The Crystal Springs Rhododendron Garden belongs at the top of the list of Portland’s hidden gems. A sprawling network of trails through rhodie groves and ponds offers a serene getaway from the city’s bustle and one of the most romantic things to do in Portland. Free from October to February and on Mondays otherwise. Pair with a stroll around nearby Eastmoreland mansions or Reed Lake. Long before there was the International Rose Test Garden, there was the first public rose garden in Portland, Peninsula Park Rose Garden. Take a stroll among the rose bushes, including the city’s official rose, Madame Caroline Testout, and past a historic fountain and bandstand gazebo. It will transport you to a French chateau, if only for a weird minute. Fifty-nine beers on tap. Best fish and chips in town. A dark, cozy interior, decorated with English memorabilia and historical photos offering a haven especially on dreary days. A visit to Horse Brass is a must for every beer lover. The best and cheapest and most crammed espresso you’ll ever have. That’s Spella Caffé, a hole-in-the-wall, Italian-inspired standing-room-only coffee shop on the Downtown transit mall. Loyal staff sling coffee drinks to even more loyal customers on weekdays only. Get the window counter for the best people-watching spot. Hiking is among the best things to do in Portland, Oregon, and the Oaks Bottom Wildlife Refuge one of the best places to do so. Don’t worry if you don’t see any hawks, herons, mallards, geese, egrets, robins, woodpeckers, or other birds hanging out around the pond. Just look up at the giant mural adorning the walls of the Portland Memorial Mausoleum towering over the park. It’s one of the largest in the country. And if you don’t make it all the way to Oaks Bottom, the mural is visible from westward points miles away. If you’re at a loss about what to do in Portland, have a laugh. The popularity of standup comedy here rivals only that of SAD (Seasonal Affective Disorder). Helium Comedy Club, Harvey’s Comedy Club, Curious Comedy Theater, and many other theaters and pubs feature standup comedy shows pretty much every day of the week. Find more fun activities in the ebook 365 Weird Things to Do in Portland, Oregon, from which this article has been excerpted. As a faithful reader of SallyAkins.com, use code SALLY to get the book for only $6.99 $3.65.